Oolong tea is an offshoot of the camellia sinensis plant. Oolong leaves are withered in the sun to cause the trademark curling and twisting, and to achieve oxidation levels between 8 and 85%. With flavors ranging from honey and fruity, to nutty and woody, roasted oolongs have aromas and textures to excite even the most stringent tea fans. Oolong Tea caffeine presence is another thing people are so much asking about, making it tasteful and beneficial. 3.1 How Much Caffeine is in Brewed Oolong Tea? But oolong doesn’t just taste good. It is full of antioxidants, too. When combined with catechin and caffeine it helps to combat free radicals, the unstable atoms that can cause damage to human cells. In fact, oolong tea is becoming quite a reputation due to its numerous healing properties. 100 grams of oolong tea will display 99.4grams of water, 0.02 g of ash, 1 calories and 0.15g of carbohydrates. Still, the same servings will offer 0.06 mg of niacin, 0.21mg of manganese, 1 mg of magnesium, 12 mg of potassium, 3 mg of sodium, 0.15g of carbohydrates, 12mg of potassium, 0.01mg of zinc and 1 mg of calcium. Oolong tea caffeine level can enhance mental health, overall alertness and sharpen thinking skills. In fact, continuous consumption of oolong tea helps to lower the chances of ovarian cancer. It aids in digestion, cures headaches and cleanses the body of smoke and alcohol. Oolong tea helps maintain body weight by interfering with the absorption of fats and carbohydrates. Taking oolong tea daily as part of a balanced diet is known to assist weight and promote better sleep. 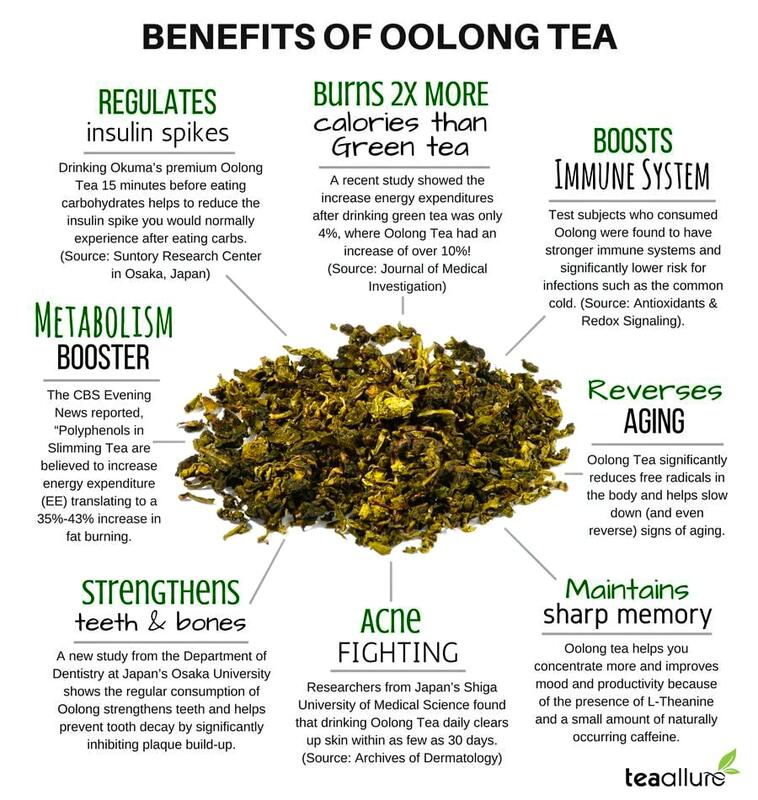 Read more about the benefits of oolong tea, click here. The Camellia sinensis tea plant is an evergreen shrub which can reach the height of a tree. They are generally pruned to bushes of a convenient picking height. The bark is slightly gray and rough with serrated leaves which are dark green, elliptical and well formed on a short stalk. The light downy bud coverings are highly prized in quality teas. The plant seeds are smooth, round, and similar in size to a small nut. The buds and the uppermost leaves usually produce the best fragrance and flavor. Tea first originated in Southeastern Asia. It grew in a broad swath up to the modern day China (Yunnan Province), Burma, Eastern Assam (India) and Laos. Cultivation of the Camellia Sinensis var plant first began 4,000 years ago, in a province called Sichuan in China. Then, later spread widely across the country. In the 800s, Camellia sinensis arrived in Japan. In the mid-1800s, it reached the shores of Taiwan. Around 1830, a thriving tea industry had established itself in the British colonies of Assam. A few decades later, had spread to the territories of Sri Lanka. The original Camellia sinensis, the var assamica which was discovered in Assam, is the second most prevalent type of tea plant. It has very large leaves and thrives well in the jungles of Yunnan and low plains of India. Besides, the sinensis variety has small leaves and is more suitable to higher elevations and tougher climates. Today, most of the world’s tea is a result of these two genetic varieties. This includes all five types of tea: green, black, oolong, green and pu-erh. Oolong tea is grown in large commercial quantities on many continents, except North America and Europe. However, Taiwan, Japan, Sri Lanka and China remain the true leaders in the production of traditional loose leaf teas. Chemically, tea leaves are known to contain naturally occurring plant compounds such as alkaloids (theobromine, caffeine, and theophylline) and polyphenols (tannins, catechins, flavonoids, the source of antioxidants. The rare combination of amino acids, theanine, and caffeine found in tea yields a drink that is both invigorating and relaxing at the same time. Caffeine is in the same class as xanthine family. It is soluble in water, odorless and has a bitter taste. Caffeine naturally occurs in tea, coffee, kola nuts, cocoa and a large number of plants. In regulated quantities, caffeine is beneficial to the body. It improves alertness, contributes to the increase of dopamine levels in the blood, can improve mood and stimulate metabolism. How Much Caffeine is in Brewed Oolong Tea? Two variables influence the amount of caffeine in brewed oolong tea. One is the type of leaf; the other variable is the method used to prepare the tea. Depending on the brewing and the variety of the oolong, a 200 mg cup of Oolong Tea can contain 12-55 mg of caffeine. Compared to black tea, which contains 23-110 mg, it’s much lower. Green Tea contains 8-36 mg of caffeine per cup, while the white tea contains 6-25 mg.
On average, 3% of caffeine is contained in tea leaves, although this level can range from 1.4% to 4.5%. Factors that determine caffeine content in dry leaves include soil chemistry, leaf position on the tea bush, cultivation practices, and altitude. For instance, the first leaf and the young bud have more caffeine content than leaves picked lower down the bush. Leaves from Camellia sinensis (the small leaf) tend to contain low levels of caffeine compared to the Camellia assamica leaves which have measurably more. Oxidation levels do not at all impact caffeine levels. Consequently, oolong, green, white and black teas all contain caffeine. Steeping time, water temperature, and the amount of tea are all factors that can affect caffeine levels in brewed tea. Tea steeped for long periods in high water temperatures tends to release more caffeine than tea brewed for less time and in cooler water. A small tea leaf releases more caffeine than a large leaf tea. Up to 80% of caffeine is extracted within the first 30-seconds of steeping. It really makes sense, though. Steeping smaller amounts of tea in cooler water for a shorter time will lower the levels of caffeine in your tea. White, green and slightly oxidized oolong teas are ideal as they can develop full flavor and aroma from short steeping times and low water temperatures. Steep your tea for 45 seconds in hot water then discard the liquid. Add the right amount of water to the leaves. Brew for the time that is appropriate for your particular type of tea. Do not exceed the recommended steeping time.